7. Get Edgy With MetalIf your home or garden aesthetic leans toward contemporary, consider using metal rather than wood to create a more modern bin unit. The designers at 415 Remodeling installed a steel enclosure in the side yard of this San Francisco home and added a living roof of mixed succulents and planters filled with evergreens and ornamental grasses to help soften the metal structure. f your home or garden aesthetic leans toward contemporary, consider using metal rather than wood to create a more modern bin unit. 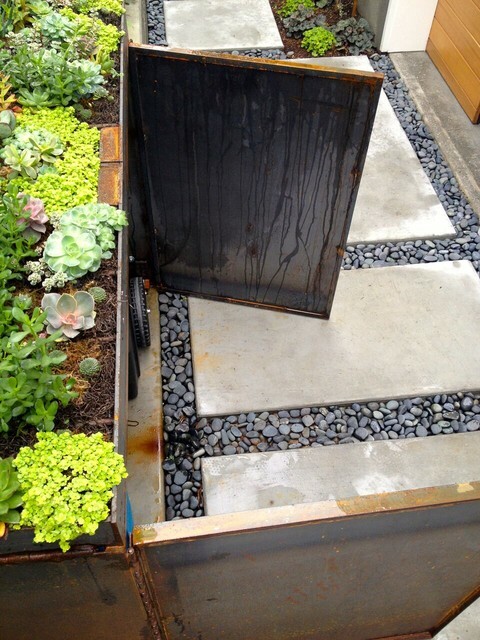 The designers at 415 Remodeling installed a steel enclosure in the side yard of this San Francisco home and added a living roof of mixed succulents and planters filled with evergreens and ornamental grasses to help soften the metal structure.